Photo By Raymundo Frasquillo: Morenci ended first in the 2016 tourney, the 13th title during 38 meets and has been a six-time runner-up. MORENCI – “Lions and tigers and bears, oh my!” No, we are not in Kansas, this is not the Land of Oz, and Dorothy and Toto will not be dropping in. Over the past 38 seasons, the Morenci Lions Club has hosted schools with mascots ranging from insects to big game as well as Apaches and Vikings. Tigers have visited Morenci, as have Bearcats, Bulldogs, Cobras, Cougars, Eagles, Elks, Falcons, Lobos, Mavericks, Mustangs, Rams, Road Runners, Yellow Jackets, Wildcats and Wildkats. The Champions and Stampede have also been in town, as have Apaches, Blue Devils, Braves, Cowboys, Redskins, Sultans, Roughriders, Trojans, Warriors, Vandals and Vikings. This week commemorates the Morenci Lions Club’s 39th year of sponsoring a baseball tournament. The Lions welcome the Willcox Cowboys, the Pima Roughriders, the St. Johns Redskins and the Miami Vandals, along with the Safford Bulldogs, the Thatcher Eagles, the Heber Mogollon Mustangs, the Joseph City Wildcats and the Morenci Wildcats to Francis Waldorf Stadium. The meet is the Morenci Lions Club’s largest fundraiser of the year. The service group provides a venue to make dreams come true, not only for the participants and spectators, but for those needing aid with vision problems in Greenlee County. A week-long camp for special needs youngsters ages seven and up is also financed by the group. All proceeds from this athletic meet go towards that end. Beginning as a three-team affair in 1979, the 2017 meet will feature nine teams and 15 games from Thursday through Saturday, April 20-22, with each having a player-of-the-game selected. Photo By Raymundo Frasquillo: Morenci Class of 2016 grad Miguel Ruiz earned the third Daniel Lopez Memorial MVP Award for the 38th tourney. The three-day tournament commences Thursday (April 20) with 3A Central Safford verses 2A East Pima at 8:30 a.m., 2A East Thatcher vs. 2A East Willcox at 11 a.m., 2A South Miami vs. 2A North Saint Johns at 1:30 p.m., 1A Central Heber Mogollon vs. 1A Central Joseph City at 4 p.m. and 2A East Morenci vs. the Mogollon – Joseph City winner at 6:30 p.m. Scheduled starts for Friday (April 21) and Saturday (April 22) games are the same as for Thursday with pairing to be decided on first day results. The championship game is slated Saturday at 6:30 p.m. Through games played April 15, Safford (15-3 overall, 7-2 region for 2nd, 12-3 power ranking record, 10.7428 rating) was No. 5 in 3A; Willcox (10-3, 9-1 for 1st, 10-3, 6.0438) No. 8, Saint Johns (12-4-1, 8-2 for 2nd, 11-4, 2.0669) No. 13, Miami (10-8, 5-2 for 1st, 9-6, 1.0082) No. 16, Morenci (8-11, 3-8 for 6th, 6-9, minus 1.6285) No. 21, Thatcher (4-11, 3-6 for 5th, 3-9, minus 3.1548) No. 26, and Pima (3-13-1, 3-6 for 4th, minus 3.5952) No. 29 in 2A; and Joseph City (8-5-2, 6-3 for 1st, 8-5, minus 0.0071) No. 8 and Mogollon (8-12, 5-4 for 4th, 6-8, minus 7.1490) No. 14 in 1A. The state’s governing body opted to change the school alignments in a cost-saving move effective for the 2012 season. Enrollments plus geographical proximities were largely the deciding factors in placement, and power-ranking records accounted for the state tourney fields. Schools numbering 233 were in Divisions I-IV, with Division I having 59, Division II 64, Division III 54, and Division IV 56 members. The A.I.A. member schools competing in the next two-year block (2014-15) totaled 265, with the breakdown of schools fielding baseball teams being 44, 77, 60, and 56 teams in Divisions I, II, III, and IV, respectively. In 2016, there were five divisions with 234 schools vying for five state titles, 30 in Division I, 46 in Division II, 63 in Division III, 52 in Division IV, and 43 in Division V.
This season, six major classifications are in effect from the smallest (1A) student enrollment through the largest (6A). A total of 239 teams, 27 in 1A, 47 in 2A, 37 in 3A, 44 in 4A, 43 in 5A, and 41 in 6A are suiting up. However, three schools did not schedule the required 14 games to compete for state titles. Through the 2011 season, the nine 2017 tourney entrants competed in Class 1A (Joseph City and Mogollon), in 2A (Miami, Morenci, Pima, Saint Johns, Thatcher, Willcox); and 3A (Safford). The first four seasons of the division format had Joseph City, Miami, Mogollon, Pima, and Saint Johns in Division IV with Morenci, Safford, Thatcher, and Willcox in Division III. This season, the nine teams returned to pre-2012 classifications. The participating student-athletes will not be clicking their heels three times in order to go home. However, similar to the movie, their success or failure lies within; they can achieve whatever they set their minds on. The sky is the limit and anything is possible. Of the original three teams, only Morenci has been in all of the previous 38 meets. The Wildcats have finished first in 13 of 19 times they qualified for the final (1980, ’81, ’82, ’85, ’89, ’92, ’94, ’97, ’99, 2003, ’07, ’14, ’16) and has been the only team to win three in a row. Morenci is also a six-time runner-up (1979, ’86, ’95, 2000, ’09, ’10). Thatcher was unable to attend the first tourney, but has not missed one since (1980-2017). The Eagles have been champions thrice (1988, ’96, 2011) and runners-up nine times (1981, ’82, ’89, ’98, 2003, ’07, ’12, ’13, ’15). The Willcox Cowboys are in their 33rd tourney (1983-2002, 2005-2017) and also 19-time finalists, 12-time champions (1986, ’91, ’93, ’98, 2000, ’01,’05, ’06, ’10, ’12, ’13, ’15) plus seven-time runners-up (1987, ’90, ’92, ’96, ’97, 2011, ’14). 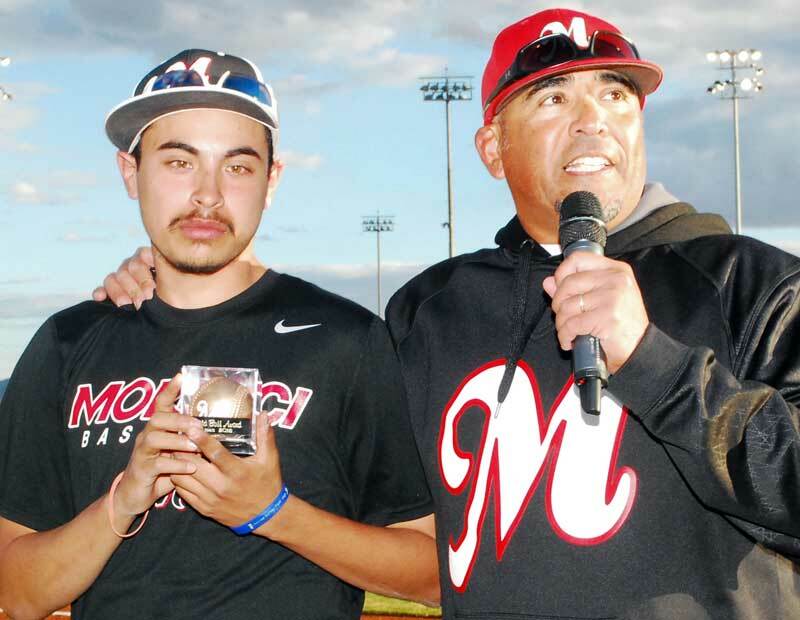 Photo By Raymundo Frasquillo: Joseph Chavarria received the Gold Ball Award from Morenci assistant coach Mick Ruiz. Pima’s Roughriders are in their 32nd meet (1986-2017); the Mogollon Mustangs (2001-17) and the Saint Johns Redskins (1993-94, 2002-05, 2007-17) both in 17th; the Miami Vandals in 12th meet (1980-87, 2014-17), ending as champions in 1980; the Joseph City Wildcats in their seventh (2004-07, 2012-13, 2017) trip to Morenci; and the Safford Bulldogs in their second (1982, 2017) venture to Wildcat Country. Over the past 14 seasons (2003-16), the nine Morenci Lions Tourney participants have gone a combined 68-79 at Arizona state championship tourneys. In that same span, state tourneys (team records) have included Saint Johns (10-13) in each year; Mogollon (8-10) in 11 years; Thatcher (10-10) and Morenci (9-10) in 10 years; Willcox (6-9) and Miami (5-9) in nine years; Pima (10-7) in eight years, Joseph City (4-6) in seven years; and Safford (6-5) in six years. Pima was the 2016 Division V state champion and a Division IV semifinalist in 2013; Safford the 3A state champion in 2008; Mogollon the 1A state champion in 2006; Thatcher the 2A state runner-up in 2005; Morenci a 2A semifinalist in 2008 and 2006; and Willcox a 2A semifinalist in 2006. The largest field in 2002 had 15 teams ranging in enrollment size from 1A schools Clifton, Pima and Elfrida Valley Union to 5A Laveen Cesar Chavez. To date, 37 (28 from 2003-2016) different teams have participated at least once. There have been 17th meets with an out-of-state entrant. The Golden State, the Land of Enchantment, and the Sooner State have been represented. Photo By Raymundo Frasquillo: Four-time all-tourney selection Ty Nanuz of Morenci was the recipient of the 2016 Robert Sotelo Memorial Sportsmanship Award. Morenci (13-6) and Willcox (12-7) are tied for the most title games played in with 19 apiece, but Morenci has won the most title games (13) and Willcox has qualified for the most consecutive championship games (6). The most combined runs scored in a championship game were 31 in the 1986 nine-innings finale (Willcox – 16, Morenci – 15) while the least was two (Willcox – 2, Thatcher – 0) in 2012. One run has decided the meet champion seven times and two runs settled six. Twice, the championship game has gone 12 innings before being decided. Morenci slipped past Hayden 6-5 in 1985 and Willcox edged Morenci 13-12 in 2010. Willcox is 3-0 in extra-inning finals. Other extra inning finales were nine innings in 1983 (Douglas – 4, Hayden – 3) and eight innings in 1993 (Willcox – 13, Clifton – 10). 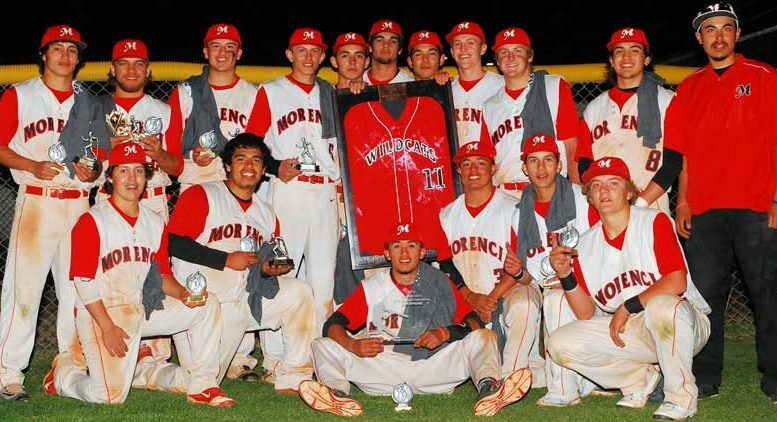 Four 5-inning title games have been recorded, with both Morenci and Willcox ending with the championship trophy. Morenci was victorious 3-0 over Willcox in 2014 and 12-2 over Miami in 2016 while Willcox prevailed 12-2 over Valley Union in 2005, with the contest abbreviated because of an impending lightning storm, and 4-2 over Thatcher in 2015. The 19-8 Willcox 6-inning 2001 win over Mogollon had been the shortest title game. Morenci’s baseball facility was dedicated in 2005, honoring 1962 Wildcat grad, area businessman and retiree Francis Waldorf, prior to the seventh place game of the 27th tourney. A year later, before the start of the 2006 season, the state-of-the-art lighting system was installed. The school has retired one former player’s jersey, of the late 1986 graduate Daniel B. Lopez who set 10 team records by the time he donned cap and gown. It hangs on the left field fence and a framed replica jersey sits in a Wildcat Memorial Gymnasium trophy case. Two Morenci Lions Club tourney awards are named for deceased participants, the sportsmanship award and the most valuable player award, in memory of the late official Jose Roberto Sotelo and Lopez, respectively. The 2016 championship game had Morenci (4-0) pulling away early from Miami. Morenci scored five runs in the bottom of the first inning as the entire line-up stepped to the plate. The host Wildcats added four runs in the second with 10 batters, two in the third with seven batters, and one in the fourth with six batters. “Miami ran out of pitchers,” Morenci head coach Joseph Morse said. Senior pitcher Ty Miami limited Miami to 15 batters through the first four innings, with only three getting to second base. The Vandals erased the zero on their side of the scoreboard by scoring two runs in the fifth with seven batters. The Wildcats reached the final by defeating Pima 9-0 in five innings during the first day, Thatcher 8-1 in five innings during the second day, and Oklahoma’s Konawa 7-4 during the third day. Meanwhile, Miami (4-2) journeyed through the losers bracket after succumbing 3-2 to Konawa on opening day, downing Willcox 14-8 during the second day, plus Thatcher 8-3, Saint Johns 15-0 in four innings, and Konawa 8-6 on the third day. Konawa (2-2) topped Saint Johns 13-5 in five innings during the second day before losing twice on the third day; Saint Johns (2-2) defeated Duncan 9-6 on the second day and Pima 4-3 on the third day; Thatcher (1-2) bested Round Valley 13-1 in four innings during the first day; Pima (3-2) downed Willcox 8-3 on the first day plus Mogollon (0-2) 5-4 and Round Valley (0-2) 1-0 in six innings during the second day; and Willcox (1-2) ousted Duncan (1-2) 14-2 in two innings during the second day.